Click here for the video of the conference. At the Berkley center for Religion, Peace and World Affairs in 2011, Dr. Jürgen Habermas presented a philosophical paper titled “On Myth and Ritual”. In the question period that followed, Professor Habermas spoke about the importance of distinguishing between the use of religious arguments in the secular public sphere and when those religious arguments are used by the institutions that form and represent the foundation of secularized political sovereignty. In assessing the role of religious arguments in a society with a secularized political sovereignty, Professor Habermas argued that we must look at whether the terms used to justify the constitutional arrangement is by a majority of the society founded upon a place of God or not; that is, whether they are in themselves secular justifications. 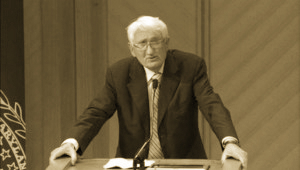 Professor Habermas concludes that it is these constitutive institutions who render verdicts and the constitutive political agencies who represent these constitutional decisions in public discourse that must not transcend the society’s own secular conditions if it is to remain to have a secularized political sovereignty. While we can for instance see the “religious overtones and implications” of the rituals of American nationalism — understood by Professor Habermas in a narrow way as mastering forces of salvation and calamity — the American constitution itself remains understood and justified not in religious terms but secular rational ones. This is what matters most in order for modernity to not only reproduce itself but find within itself the solutions to its own contradictions. “Every institution that legislates, or administrates or has verdicts, which they have to justify to citizens in a general and generally accessible language; as soon as they use religious arguments, we are no longer living in a political society with a secularized political sovereignty”. If a situation arises that there be a conflict between religious arguments and competing nationalisms, the constitutive institutions must refer to interpretations and indeed those that represent them in public discourse must indeed not transcend its secularized conditions and instead seek “law that stand on its own feet”.